MIKE SIMPSON @ Gear Music: Canada's Best Online Music Store! Although he is a relatively new addition to the Toronto music scene, Mike has already proven he has a lot to offer. A recent honours graduate of Humber College's music program, he has performed alongside jazz greats such as Steve Gadd and Randy Brecker. 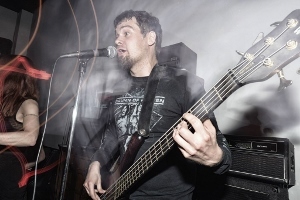 In addition to small group jazz gigs, Mike also balances his time between bands ranging in style from funk/rock (Pure Finesse) to full-on metal (The Womb, Pinion). Mike is currently in the process of recording a studio album produced by Jacksoul guitarist Justin Abedin.